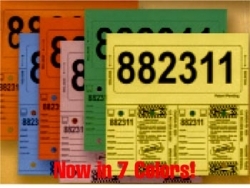 Stock sticker number comes away from sticker with no adhesive residue and becomes sales person's record or goes with paperwork. Choose from: Blue, Green, Orange, Red, White or Yellow. Key tags folded size is 1-1/4" x 3"
Stock sticker is 3" x 6"